This is the "Event Detail" view, showing all available information for this event. If registration is required or recommended, click the 'Online Registration' button to start the process. If the event has passed, click the "Event Report" button to read a report and view photos that were uploaded. 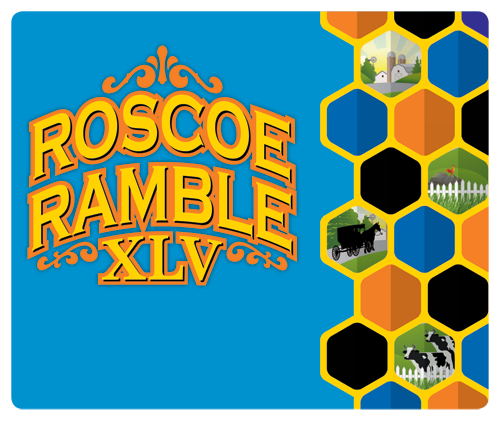 The 45th Roscoe Ramble begins Saturday, Sept. 14, in Canal Fulton (long route) or Kidron (short route) and winds its way through rolling farmland to Roscoe Village. You will stay overnight in nearby Coshocton and return to Canal Fulton or Kidron on Sunday, Sept. 15. The ride is intended for the well-conditioned rider so be sure to consider the shorter route if in doubt. The Sunday ride offers challenges of hills and dips heading back to the Saturday start. If you registered for the 55 mile per day ride, please download these check-in instructions. Likewise, 75 mile per day riders should download these check-in instructions. Once you select your registration you will prompted to choose your lodging option. The lodging options have been selected by the ride directors to ensure that your lodging meets Roscoe Ramble standards. 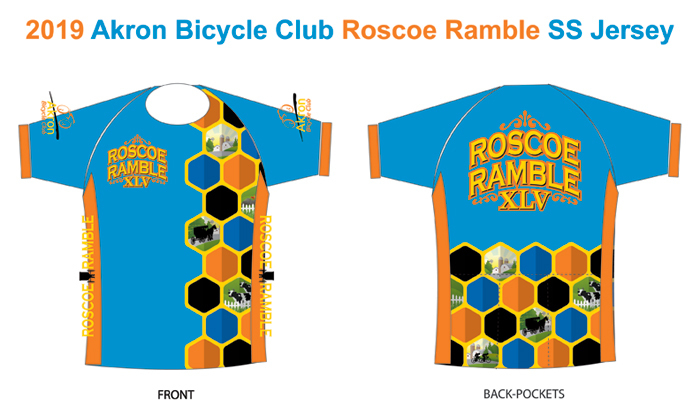 A custom jersey will be offered, and participants will be contacted prior to the ride. Roscoe Ramble is an Adventure! For a great souvenir, see our specially designed jersey. Order your jersey when you sign up. $60 for members, $70 for non-members. Orders for jerseys will close a couple of weeks before the ride so they can be printed and available. Thank you Judy and Jim and all of the Arron bicycle club volunteers (and friends) for a great weekend riding! The course was heavenly and you really made such efforts to care about each rider!! Thank you from the bottom of my heart. The smoothies and fruit today was the best rest stop a cyclist could ask for ( a taste of heaven) and all of the help from rest stops to sag to organization were stellar and top notch. THANK YOU. So much work! But here is one cyclist that will fondly remember it forever. Both Nance and I really enjoyed our first Roscoe Ramble. You guys did a fantastic job. We both especially liked the presentations and talk at dinner on Saturday. We will see you next year for our second Ramble (Lord willing and the creek don't rise). If you are a single rider who wants to have your own room, specify the "single" option. If you are riding with a spouse, you can register together and list as roommate." If you wish to stay in the campground, you may select that option. All riders must wear a certified bicycle safety helmet. Safety is our concern therefore: no use of ear buds or cell phones while riding. Starts at Canal Fulton on Saturday Morning with a 75 mile route to Coshocton. Saturday lodging in a recommended motel in Coshocton for a single person or a couple. Double room for two people in one of the recomended motels for Saturday night.